We often get asked the question, ‘how do I fix a 1996-2006 Yamaha 115 HP outboard motor that will not start?’. 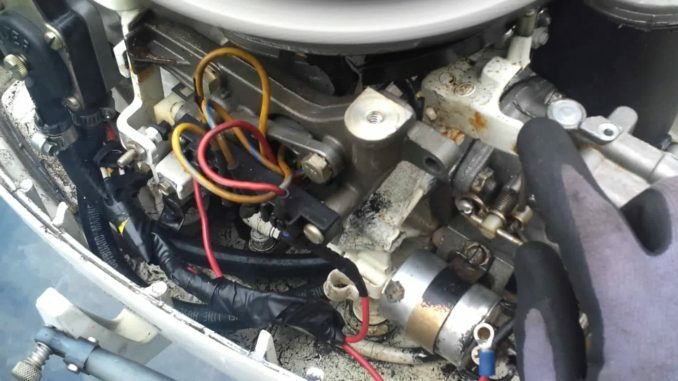 This article outlines a set of troubleshooting procedures to help you repair a Yamaha 115HP outboard that will not begin to work. Troubleshooting helps the mechanic to trace and correct faults in a Yamaha outboard’s electronic or mechanical system. It’s a systematic approach to solve a serious problem, and used to narrow down a list of possible causes. In mechanical terms, a motor that won’t start is defined as one that “does not turn over.” However, a Yamaha 115HP motor can still turn over but not fire up. This article will cover both outboards that do not turn over or start and outboards that turn over but won’t start up. Make sure the battery switch is ON. Test battery switch operation if needed. Inspect battery connections and cables. Torque down connections if needed. Check for corrosion and clean if necessary. Check for voltage drop in starter circuit. Fuse (10 A). Inspect wiring and replace the 10 A fuse if faulty. Damaged electrical harness, bad ground or faulty connection. Inspect all wire harness connections, wires and grounds. Battery discharged. Test batteries charge and recharge or replace if needed. Key switch. Test key switch operation for malfunction. Wiring harness. Test for 12 V at terminal “B” pf leu switch. Starter solenoid. Check cable connection to solenoid. Test starter solenoid with multimeter. Seized power unit or gearcase. Inspect and repair if necessary. Bendix/drive gears or starter. Perform a check on the starter and inspect bendix/drive gears. Stop circuit grounded. Make sure the safety lanyard is installed. Make sure the stop circuit is not grounded. Inspect the emergency stop switch and wiring. Outboard in gear (tiller models). Put the 115 HP Yamaha outboard in neutral. Water in gasoline. Check the fuel filter for water. Take a sample of fuel from the fuel return manifold. Contaminated or poor gas quality. Inspect fuel, replace if needed. Add correct fuel grade. Fuel supply restricted. Inspect fuel pick-up, check primer and anti-siphon valve. Air in fuel system. Refer to a repair manual for air in fuel supply manifold service procedures. No or low fuel pressure to injectors (EFI models). Refer to factory repair manual for how to check fuel manifold pressure. Inspect carburetor (carb models). Refer to repair manual for carburetor servicing and troubleshooting procedures. Internal powerhead damage. Check power unit and repair as needed. No or low compression. Use a compression tester to test cylinder compression. For more, detailed information on how to fix a 1996-2006 115HP Yamaha outboard boat motor that won’t start, download a manual. A download repair manual covers every aspect of maintenance and repair—from a simple oil change to complete engine overhaul. This information on this page applies to the 1996 1997 1998 1999 2001 2000 2003 2002 2005 2004 2006 115HP Yamaha outboard boat motors.